Sam couldn’t wait to get out of Michigan and her family’s orchard and pie baking business. She had much grander dreams of being a chef in the big city. But after working for an ungrateful and just plain not nice Chef, she is ready to come home for a bit. 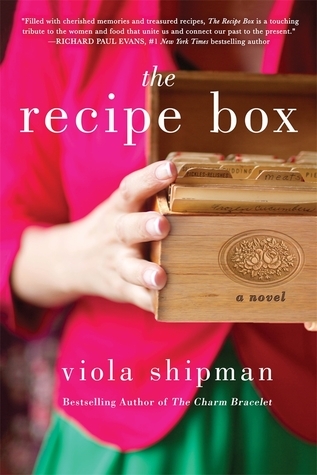 While Sam feels around for her own place in the world, her mother and grandmother share their recipe boxes and baking and as always with Shipman, sage advice and stories of family, love, relationships between mothers and daughters and how sometimes you may just need to take a second, and realize that everything you want has been right there in front of you. The food descriptions are scrumptious! Oh my goodness I think at one point I was crying and drooling at the same time! I was interested in this one recently, so thanks for the review! I’m always interested in anything cooking related in fiction. I love to see how they work with it and describe things! oh the descriptions are so good you can smell them! Definitely have going to be checking it out then!! If you want a recommendation for another great book consisting of cooking and great characterization you should check out “the school of essential ingredients” by Erica Baurmeister. A great book of delicious food and life lessons. Lol! all of Shipman’s covers are like this. So lovely! Just saw! So pretty indeed.